"My Garden," was the chosen painting to be displayed in the book. "My Garden" also won the third place award at the Red River Valley Museum Juried Art Show, Vernon, Texas. 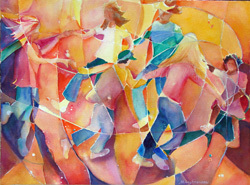 This painting was also accepted in the 40th Annual Southwest Watercolor Society's Juried Exhibition. 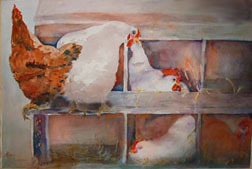 Published Artist in the National Juried "Best of America Watercolor Artists & Artisans" Vol.1, page 21, Kennedy Publishing Services, May, 2007. "My Cup Runneth Over," Published Artist in the selected works from the Park Cities Presbyterian Church Arts Festival, Dallas, TX 2007, "23 on 23," written and collected by Dr. Pete Deison, page 67. Visual Arts Society of Texas, 9/2011, "Cousins"
Visual Arts of Texas 37th International l Exhibition, Denton, Texas. 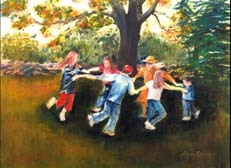 "Afternoon Peace," was awarded First Place at the Visual Arts Society of Texas Artist of the Month Mini-Show, and was also chosen for the month of June in the Calendar Contest for 2005. 2005 VAST Anual Juried Members Exhibition. "Need a Hat" won a material award at the Texas Visual Arts Association Citation 2004 juried show, Dallas, Texas. 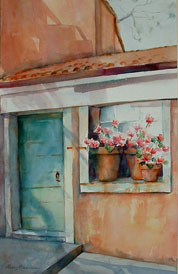 "May in Italy" won fourth place at the Kiamichi Owa-Chito Juried Art Show, Beavers Bend Park, Oklahoma. With Mary is Ken Hosmer, renowned artist and Juror of the show. Mary grew up in Oklahoma, and now lives in Texas. She always loved art, but it was not until her children were grown, and she had finished her Ph.D. that she finally got to do what she always wanted to do--study drawing and watercolor painting. 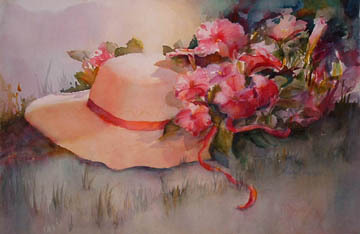 Mary says she paints the "colors of life" in her wide variety of watercolor subjects - bright florals, cowboy hats, chickens-- subjects that she "just has to paint!" She has studied watercolors with regional and nationally known artists-- Zoltan Szabo, Ken Hosmer, Tom Lynch, Naomi Brotherton, Carol Maddox at LaRomita in Terni, Italy, and Judy Morris in France. 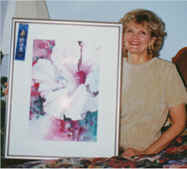 Mary's paintings have won awards in juried shows in Oklahoma and Texas, and her paintings are in international private, and corporate collections, and has presented several Solo Invitational Exhibitions.She is a published Artist in the National Juried "Best of America Watercolor Artists & Artisans" Vol.1, page 21, Kennedy Publishing Services, May, 2007, and in "23 by 23," the selected works from the Park Cities Presbyterian Church Arts Festival, Dallas, TX 2007, written and collected by Dr. Pete Deison. 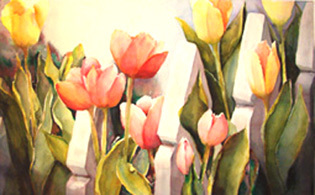 Mary is the founder of the Oak Point Art Society and is listed in the World Artist Directory of Accomplished Artists World Wide. She is represented by the Oxide Gallery, in Denton, Texas. Mary was a Professor at Collin College, Frisco, Texas, in the Computer Science Department for twenty years. 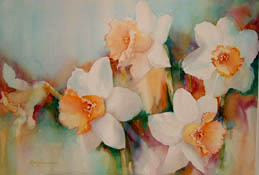 Currently, she teaches watercolor classes and workshops in Texas. 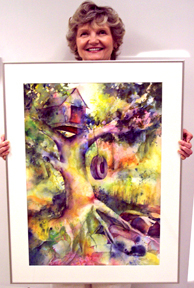 She is a member of Southwest Art Society, Oak Point Art Society, and the Southwest Watercolor Society.